Ever since the Honorable Judge James Justus started sporting his "totally-killer" ponytail we haven't been allowed to bring a camera in the courtroom. It took a while to capture this shot, but Justus appeared at Lincoln Days a few months ago earning top honors by the Branson Edge for "Best Hairdo Sported by Male Politician". Justus, father of Missouri Senator Jolie Justus made an appearance at Branson City Council last week to block the creation of a proposed Planned Development (PD) named Bay Harbor proposed along the Taneycomo shoreline. Branson Area Police Forces are spamming press releases hoping to curtail drunk driving over the Fourth of July holiday weekend. Celebrating the nation's independence from British rule is often celebrated with explosives and booze. Unfortunately amateur pyrotechnicians and drunks make this weekend especially perilous. Law enforcement officers will be setting road blocks throughout the tri-lakes area. Although it's never a good idea to drink and drive (idiotic), the potential for serious legal issues and severe bodily harm is especially high during this celebratory day. Celebrate safely. 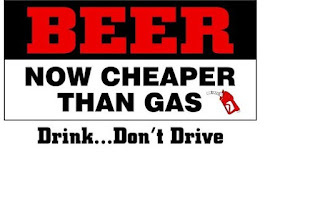 For a substantial fee the "Branson Edge" is assigning designated drivers during the weekend. Prison and/or death is no way to celebrate Independence Day. There is a big difference between seeing a live show with a packed crowd and a small audience. The entertainers play off the energy of the audience. Branson Alderman were a bit slap happy late in the evening Monday night recovering from the adrenaline resulting from a lively debate over a Planned Development called Harbor Bay. The planned development was rejected by city leaders after second reading. Playing politics in front of a full-house energized city leaders who've been putting in long hours since more extensive governance policies were placed by Branson's new regime. The commitment of city council has extended from biweekly to once a week meetings in addition to mandatory attendance for multiple committees. Alderman Sandra Williams went out of her way to acknowledge and thank members of the community for showing up and voicing their opinions at City Hall as the meeting concluded near 11:00 PM. If you haven't had a chance to see your government in action; take the time to come out to a city council meeting. Many citizens are skeptical about their potential influence on government and their ability to make a difference. Last week I attended a seminar on lobbying. You'd be surprised to hear the response some of our senator's gave regarding citizen's right to petition government. In general, leaders want to do a good job and represent their constituents. It's more than a right, it's a responsibility. These things happen. There are "professionals" who walk the halls of government facilities successfully bending the ears of "public servants". If you let these individuals take over your government - it's your fault. Participate. Write your city leaders, show up to city hall, listen to the meetings. If you care, let them know that you believe what they do is important. These individuals affect you and your children's lives substantially. It's your nation, country and community. Make a difference - it's your responsibility as a citizen to participate - to keep us free and self-governed. 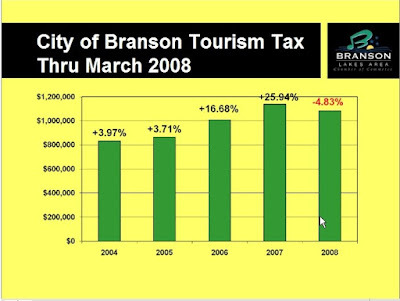 Branson Lakes Area Chamber of Commerce and Convention Visitor's Bureau presented their 2nd Quarter 2008 marketing report Monday night. Reports issued through several media outlets were posted this afternoon on Branson Agent. The media response was mixed focusing on one or two components of the 70 page presentation extrapolating conclustions from just a couple of facts. The Branson Chamber of Commerce pulls intelligence from a variety of sources and these quarterly reports provide top-tier regional marketing intelligence. Every quarter we publish the full report as presented by Branson Chamber representatives. In response to comments regarding website lag - we've posted the entire presentation on the Branson Edge home page. We're also in the process of updating the 12 month rolling averages which is linkable from the Branson Edge homepage. The 12 month rolling stats provide insight to current trends and provide a snapshot to the Branson economy. It's hard to find someone willing to sue the government over the right to pay taxes. Enter Doug Coverdell owner of Coverdell Enterprises. The lawsuit Coverdell filed relates to property within the Branson Landing TIF district, commonly known as Branson's North Beach Park. The suit filed in Taney County this afternoon challenges Empire District Electric Company, The City of Branson and Timothy J. Houtchens who is employed by the Taney County Assesors office as a mapper. Count one of Cloverdale's suit asks the court for an "Easement by necessity" which would provide him a private road to the land north of Belk's parking lot. Count two asks for damages for "Slander of Title" claiming the City of Branson and Empire District Electric Company have made false statements regarding title to the disputed property. Count three asks for damages for a "Civil Conspiracy" involving the city of Branson, Empire District Electric and Houtchens. Coverdale's claims Houtchen's actions prevented him from paying taxes on the property. Coverdale's filing follows a heated debate in Branson City Council chambers where a request to create a Planned Developement just two miles away was rejected by city leaders. This is the last day to vote for 417 Magazines 10 most beautiful women contest. ST. LOUIS – A ‘deceivingly tougher’ Tour of Missouri will challenge the field of 120 world-class cyclists from 15 elite professional teams when they line up for the September 8th – 14th Tour of Missouri, race organizers announced today in the overall race finish city St. Louis. Each of the seven courses for the week-long event were announced by Lt. Governor Peter Kinder, race director Jim Birrell and two-time stage winner Ivan Dominguez of the U.S.’s top domestic squad Toyota-United Pro Cycling Team. After several pre-events in the Kansas City metro area, Stage 1, Monday, September 8th, will start in new host city St. Joseph, and pose a bigger challenge for cyclists through rolling terrain along the Missouri River before a circuit finish in Kansas City’s Country Club Plaza district for the second straight year. Stage 2, Tuesday, September 9th, will be the most flat but longest stage, routing from Clinton to Springfield. It is a re-make of last year’s course, which proved to be the decisive stage of the race after a long breakaway put race champion George Hincapie into the race lead for good. Stage 3, Wednesday, September 10th, remakes last year’s time trial course in Branson, and has been cited as perhaps the most pivotal stage of the race, starting at The Landing and finishing at Shepherd of the Hills. Stage 4, Thursday, September 11th, is a new course that will take cyclists from Lebanon to new host city Rolla in south central Missouri. Cyclists will be challenged by six sizeable hills, in perhaps the toughest stage, to the finish on a college campus at the University of Missouri-Rolla. The race also will feature a sprint through Fort Leonard Wood Military Reservation to commemorate U.S. Armed Forces. Stage 5, Friday, September 12th, a new course, features a start in the quaint town of St. James, a new host city, and routes north to an early-evening finish in front of the Capitol Building in Jefferson City. Cyclists will race up a tough 300-meter climb to the finish line. Stage 6, Saturday, September 13th, will use part of last year’s penultimate stage, starting in Hermann and routing along the twisting highways near the Missouri River and feature the two longest climbs of the tour on Schluersburg and Old Colony Roads before passing through the city of O’Fallon and finishing near the same location in St. Charles along the Mississippi River. Stage 7, Sunday, September 14th, will feature the circuit used from last year’s final stage in St. Louis, but will have several new features. The race will be moved from Union Station to a start and finish in front of City Hall on Tucker and Market Streets. The circuit will be stretched to 14 miles and include a large section through Forest Park and feature the Grand Basin and the Art Museum hill. Last year’s inaugural race suited Dominguez, who won the opening stage in Kansas City and the closing stage in St. Louis, and has become a big fan of the Tour of Missouri despite the tougher terrain. The Tour of Missouri is supported principally by Missouri Department of Tourism, Edward Jones, Drury Hotels, Missouri Farm Bureau, Emerson, Anheuser-Bush, and the Missouri Wine and Grape Board. It is a free, public, international event that began in 2007 and attracted an estimated 370,000 spectators over six days. The event is managed and marketed by Medalist Sports, Inc., of Atlanta, Ga., and KOM Sports of Colorado Springs, Colo., the leaders in cycling management and marketing in North America. The Tour of Missouri, Inc., is set-up as a non-profit organization for the sole purpose of staging a world-class cycling event for the purposes of promoting tourism, community affairs, and its sponsors. Town fathers Leon Combs and Peter Herschend pose with US Rep Kenny Hulshof. Before introducing a local politician to Hulshof Herschend confessed you can't get a clear understanding of the candidates stances in 30 second sales pitches. "I know all three candidates on a first name basis, they're all good horses, but this is the horse that wins the race." Combs stumped for Hulshof touting his experience and support for free enterprise mentioning his US Chamber of Commerce endorsement released last week. Yakov Smirnoff supplied entertainment for the $1,300 plate fundraiser in Branson Friday Night pictured above with Kenny and Renee Hulshof. Results from the fundraiser haven't been reported but easily exceeded $50,000 for Hulshof's gubernatorial bid. The Southwest Missouri Republican elite were up in arms when Missouri Governor Matt Blunt refused a re-election bid. Already in the process of staging fund raising events the Taney County Republican faithful switched tracks putting muscle behind Republican gubernatorial Candidate US Rep. Kenny Hulshof. Leading the charge, Peter Herschend issued Golden Tickets to Branson business owners inviting them to meet Hulshof tomorrow night at the Branson Convention Center. In response - Leading the Democrat opposition - Peter Tsahiridis a Democrat running for Missouri 62nd District State Rep, is hosting a rally for Richard Manroe just blocks away at the Euro Cafe in Downtown Branson. Former Federal Prosecutor Richard Monroe will be the Euro Cafe's guest of honor. Manroe is running unchallenged in the Democrat Primary challenging Rep. Roy Blunt for Missouri's 7 District Congressional seat. September 21- 6 PM - THE SPRINGFIELD SYMPHONY WITH SPECIAL PERFORMANCES BY CARRIE APRIL TILLIS & ANDY WILLIAMS! The picture above is of Rueben Branson's tombstone which sits in a public cemetery in Downtown Branson. Debate over access to the site ensued yesterday during a planning session at Branson City Hall. Though booked as a haunted tour, the nightime tours which start at the Branson Landing is more of a historical tour of Branson's downtown district. Tour guides promise "paranormal" impressions on digital cameras from people who take the trip through commercial street. Few Branson business's are open after dark allowing groups of 20 people to walk unabated late at night through commercial street while tales of Branson's past are recited. The public cemetary on the final leg of the tour is one of the more eerie spots but residents voiced concern over disturbing the resting place of Branson's orignal town fathers prompting Branson City Council to consider new ordinances related to visiting hours. The Haunted tours vowed to refrain from entering the cemetery as a compromise to avoid legislative action. The Kansas City Star ran a story yesterday where the "Live Music" status is questioned. With 2008 being a major election year on the national, state and local levels, Branson officials want to remind candidates and their supporters about the legal placement of campaign signs in the city. Campaign signs, or any signs for that matter, are not permitted on city property, which also includes utility or city sign poles located on public property. All signs, including campaign signs, must be at least five feet back from a city street curb or sidewalk. According to Branson Planning and Development Director Don Stephens, campaign signs can be placed anywhere on private property where other types of signs are permitted. Stephens also recommends getting permission from private property owners to install signs on their land, even if it is undeveloped land. Signs can be removed by any city employee who sees them within five feet of the street curb or sidewalk. Citizens can also call City Hall if they have a concern or question in regards to a sign’s location. When removed, the signs are taken to City Hall, usually the police department, and the sign owner is called, told about the violation and given the opportunity to pick up the sign. City code requires political signs to be taken down within 30 days after the election for which they were made. For additional information or questions concerning the placement of political signs in the city, citizens can call Don Boyer in the Planning and Development Department at 337-8539. Branson's Gas Buster program made national headlines again this week recieving airplay on National Public Radio (NPR). The most recent story (click the link above to hear) was submitted by Missy Shelton of KSMU and includes sound bites from the Titanic, Presley Country Jubilee owner Steve Presley and customers shopping at Dicks 5 & 10 in Historic Downtown Branson. Visitors who present 40 dollars in tax reciepts at the Branson Chamber of Commerce recieve a discount card good at over 100 businesses in Branson. Branson City leaders gained more control over the hiring and firing of three city positions last night. A proposal allowing Branson's city clerk, attorney and administrator can be removed with a majority vote of Branson's Board of Alderman passed last night. The three bills require a second reading before they'll be enacted into law. In half an hour Branson city leaders will debate whether or not they'll be moving to a new form of government. Debate during last weeks city council meeting became heated as Alderman Sandra Williams brought up the idea under the premise the city of Branson would be altering city ordinaces defining what authority city council has in the hiring and firing process. Branson's Board of Alderman has the authority to confirm or deny the appointment of the city attorney and city clerk, but the change would give them the right to terminate their employment with a vote, whether or not the city administrator thought such action was deemed necessary. This is not a sugar-free weekend for me. All week I've been working on a candy store that should launch before the weekend is over. Incumbent Dennis wood stumped against Jeff Justus for the Missouri House of Representatives 62 District seat. If Wood is re-elected he'll be disqualified to make another run ue to term limits. The winner of the Repoublican Primary Contest will battle Peter Tsahiridis who is uncontested in the Democratic Primaries. Roy Combs and Danny Strahan paired off last night for the Taney County Federated Republican Women at the Taneyville Center. Incumbent Strahan claims to have knocked on 4,800 doors to win his first bid. Combs launched his career into retail politicking with gifts of flashlight-screwdriver-keychains. Common sense reveals that the County Government structure is an ineffective and dangerous model of governance. Three men will end up controlling somewhere in the neighborhood of a $90 million dollar budget. The Eastern Taney County Commissioner will fight to bring as much of the money away from the source - (Branson) and filter it to Eastern Taney County interests. As a result (both are probably perfectly fine fellas) whoever wins will be crowned Eastern Taney County Pharaoh and righteously scorned by the website that represents - Branson Missouri. Both candidates were given three minutes to stump in front of Taney County Federated Republican Women guests. Shila L. Wyatt President of the Taney County Federated Republican Women and hosted a Meet the Republican Candidates Night Wed, June 5. American Idol top 12 contestants are the stars of a new "concerts series/show" which Branson will host starting later this month. Proprietor Steve Drummond met with staff at the Branson Landing yesterday to celebrate a release broadcast on Entertainment Tonight. The show will be billed as "America's Favorite Finalists" exclusively starring Top 12 American Idor contestants from the shows first six seasons. Congressman Roy Blunt addressed the achievements during the last legislative session while in Branson, Mo last week saying, "It was no work at all by congressional standards." Three bills which expand the power of Branson City Government were proposed by Alderman Sandra Williams today during a planning session. The first would give Alderman the ability to fire a city administrator with a simple majority vote of the board. Similarly, Branson's City Clerk and Branson City Attorney would also be hired and fired in the same manor. The bills were initiated by City Alderman Sandra Williams who openly criticized Branson's City Attorney during several Branson City Council meetings earlier this year. Movement to create an easier method of "removing" former City Administrator Terry Dody was well under way before his resignation last year. Branson Alderman selected a new administrator last month after a year long vacancy. Branson's Mayor and Alderman Williams denied the city was trying to move positions on the board from a volunteer to a paid body during a brief discussion this afternoon. Barack Obams celebrated winning the Democratic Presidential Nomination (click here to read the transcript). Mavis Busiek was crowned with the title Missouri Republican State Secretary through a vote on the Missouri Republican Convention floor Friday. She's held a lot of positions in the party and has been a longtime supporter and party activist for Congressman Roy Blunt. Busiek foreshadows the party strategy of embracing Ron Paul advocates in hopes they'll help energize and participate in the party. The term "microwaveable" is a good analogy as Missouri Republican Party embraced Ronpublicans by granting "non Missouri Blue Book Certified Libertarians" delegate status. Currently, Ron Paul is the only candidate besides John McCain still in the Republican Primary Race. Ronpublicans attempted to change the rules for greater representation during the next convention. The effort was unsuccessful. The "winner take all" Republican rules were being challenged by the group. Earlier this month Sen. Hillary Clinton boasted, "By Republican rules I'd already be the Democratic Candidate." Still, most Ronpublicans wore a "contested delegate" badge at the convention to identify their political affections. In this way they were easily identified through color coated badges. Photo Tom McMarris shows a florescent green "Contested" badge while the gentleman in the background sports the official delegate red card. McMannis argued the majority of Ronpaulican delegates didn't show up to the convention due to anticipated rejection. A motion to allow alternates to fill in the gaps was denied. Many proudly wore stickers noting their "old school conservative" leanings. State Republican Conventions have been known to linger on, however, an early motion to close the session was used shut out a potential Ronpublican Convention Floor Delegate filibuster. Missouri Sen. Michael Gibbons revealed his intention to run for Missouri Attorney General last April 2007 - the radio package was sold to a local radio station and should have made its way to MissouriNet. I think it's important to note that the parents of Branson native Missouri Senator Jolie Justus's parents were kind enough to pose for a photo with Gibbons. The clip above was shot Friday May 30th at the Branson Convention Center. A few of the talking points made their way into Gibbons speech Saturday May 31, 2008 on the convention floor. Gibbons states in the clip above that his health is better now than before his surgery earlier this year. Sidenote: 38th Circuit Associate Division I Judge Jim Justus never allows me to bring a camera in the courtroom when he's having a bad hair day. Senator Justus claims her father has "never has a bad hair day in his life" and claimed she believed her mother was a closeted Democrat. This year we grabbed a photo of his totally fabulous new hairdo.. Unfortunately, Missouri Senator Jack Goodman stumped for Gibbons in his absence so a before/after photo isn't available. Senator Kit Bond threw support to Republican Gubernatorial Hopeful US Rep. Kenny Hulshof Saturday during Missouri's Republican Convention. A representative from Kit Bond's office leaked the information to KY3 beforehand and held a press conference while "Old School" conservatives aka Ron Paul sympathizers played "Parliamentary Procedural Fun" threating tee time at a local golf course for Republican Delegates. Meanwhile, Kenny Hulshof pulled the press into a corridor to enjoy the afterglow with the media - video to come. John Combest noticeably twittered with joy that the "press had left the buiding". Immediately afer the press conference Hulshof joined his wife for a cup o' cofee at the Chateau on the Lake Coffeeshop where he shared a line with Republican Challenger Sarah Steelman who was joined by her son in beating Hulshof to a race for a pastry. Answer - Obviously since KY3 stuck around long enough to broadcast the news Bond was endorsing Hulshof. MissouriNet's Steve Walsh was particulary impressed by Steelman's response conjouring the post: How to respond to an endorsement. unfazed and responding to the news by reminding Senator Kit Bond endorsed Republican Icon Ronald Reagan's opponent during his first presidential bid. 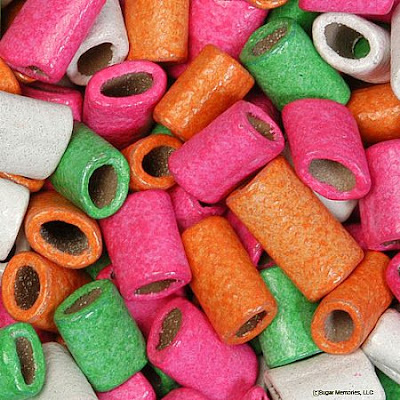 Steelman's comments were first made over a bag of jelly beans - Ronald Reagan's favorite treat. Either Steelman was prepared for the endorsement or really likes jelly beans. MIssouri Repulbican Convention 'Media Featured 5 "
As one of five media delegates assigned to the Missouri Republican Convention floor I opted not to bring my injured laptop. We were given a bullpen behind the seated delegates with heavy security surrounding us ensuring we didn't attempt a run out to the floor. The floor was tightly controlled with exception made to this blog's author and the Missouri Political Media "Featured 5"
David Lieb Associated Press - Lieb became frustrated by the lack of hackable Internet Access at the Ron Paul rally. Whatever David Lieb writes will be published in the Branson Daily News (BDN) and, Branson Daily Independent (BDI). Chad Livengood- Springfield News-Leader led with Rod Jetton this morning "Power Struggles and Secrecy". Livengood replaced Tony Messenger who is currently working for the St. Louis Dispatch as a Jefferson City correspondent. Jason Rosenbam - Columbia Tribune. Until Rosenbaum started publishing video this year -we were number one. Rosenbaum beat me to the punch on video footage; however, we have a full understanding of his information and posting methods which could result in decent technical consulting gig. St. Louis Dispatch - Jo Mannies joined Steve Walsh with stories from journalism's past including instructions on how she use to evade audio leak from paper thin walls which a competing paper used to steal her reporting mojo. Mannies is feisty with a healthy respect for the finer points of political and philosophical debate. I have a feeling she'll enjoy the video archives we collected this weekend. Steve Walsh - MissouriNet - Walsh is an old school journalist who issued a lecture about "back in the day" - when you had to crank your typewriter - long before the invention of white out. Walsh's coverage will be purchased by our local radio station promising local news director Steve Willoughby won't pay a dime for digital assets acquired through freelance. Walsh continued our discussion by posting a thanks to Stephen Marshall for the $2,500 WIFI and kind words for Missouri Republican Party Communications Director Tina Hervey. ***Pssttt Walsh.- In Iowa the Republicans and Democrats provided extensive media services in the Google Lounge stocked with cushy chairs, free beer, wine and vitamin drinks. Both Democrats and Republicans agreed Missouri Beer was best stocking kegs of Bud from ST. Louis and Boulevard Wheat from Kansas City. John Combest - John Combest was a plant on the Republican Floor. In order to get a seat he apparently pledged himself in marriage to a Republican Delegate (truly dedicated). Combest twittered What I was thinking - NOBODY FROM THE PRESS IS ON THE CONVENTION FLOOR. Saturday night,after the convention Combest took a tour of my hood. It's haunted by reporters of Missouri's Past. The Video above is with Missouri Rep. Rod Jetton regarding the controversial village law.